Seven feet tall. Four hundred pounds. A rusty steel plate screwed into his skull and razor-sharp fingernails that pluck out his victims' eyes. Reclusive psychopath Jacob Goodnight is holed up in the long-abandoned and rotting Blackwell Hotel, alone with his nightmares until eight petty criminals show up for community service duty along with the cop who put a bullet in Jacob's head four years ago. When one of their own is kidnapped by the killer and her fate uncertain, the remaining lawbreakers must fight this indestructible force of nature with a violent score to settle. 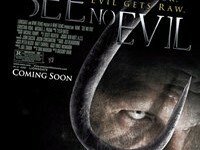 "See No Evil" stars World Wrestling Entertainment superstar Kane. The movie was directed by Gregory Dark.